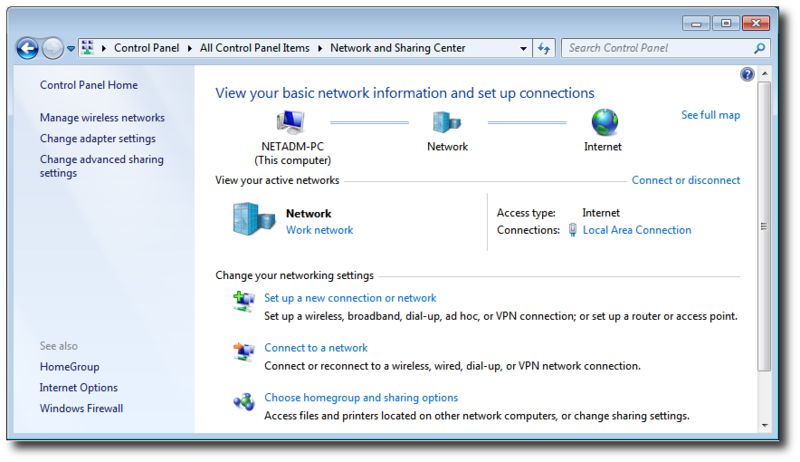 The following instructions assume that your wireless card and connection profiles (SSID) are controlled by Windows 7 "WLAN AutoConfig" system service. If your wireless card and SSIDs are managed by some other utilities, then please consult the instructions for your particular utility. 1. Open the Control Panel window. 2. 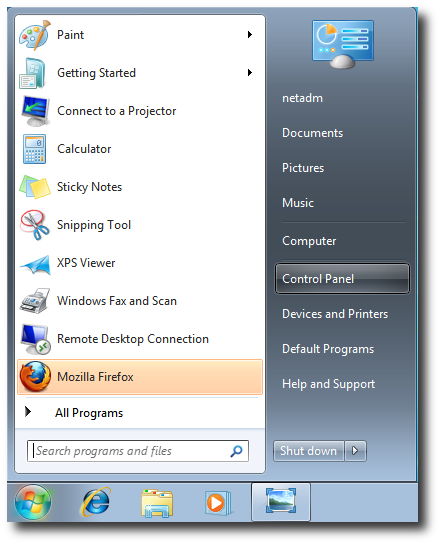 In the Control Panel window, the exact arrangement of the items in the window may be different than the picture here, depending on what view is chosen in the Control Panel window. 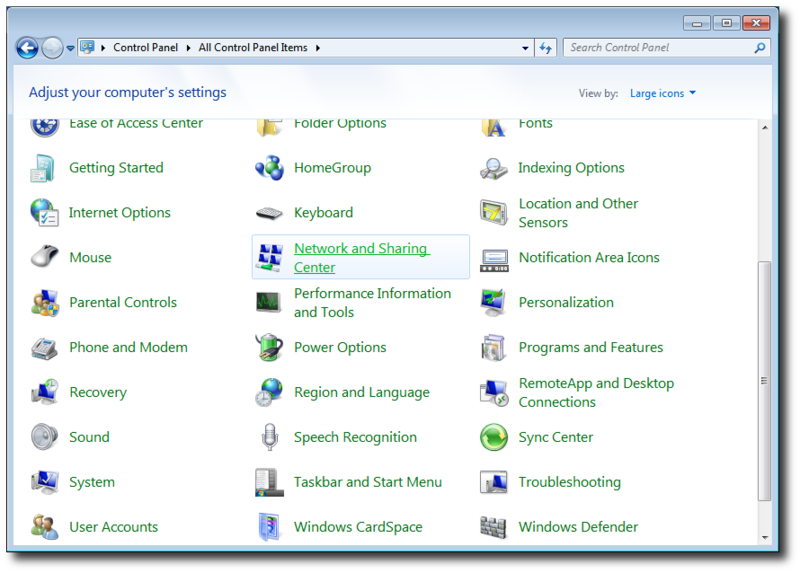 In the Large Icon or Small icon view, click on the Network and Sharing Center icon. 3. 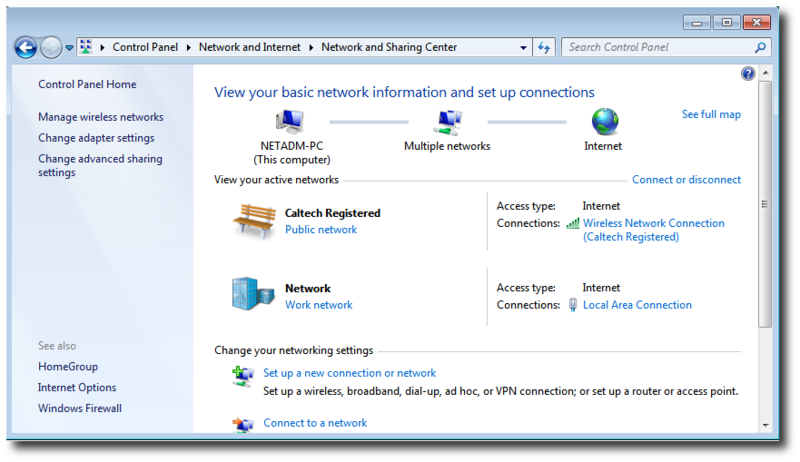 In the Network and Sharing Center, click on the Set up a new connection or network link. 4. 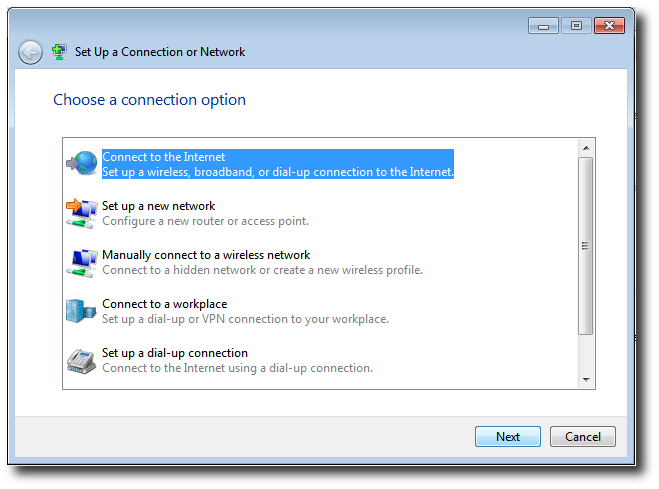 The Set Up a Connection or Network dialog will appear. Click on the Connect to the Internet item to highlight it. Then click on Next. 5. 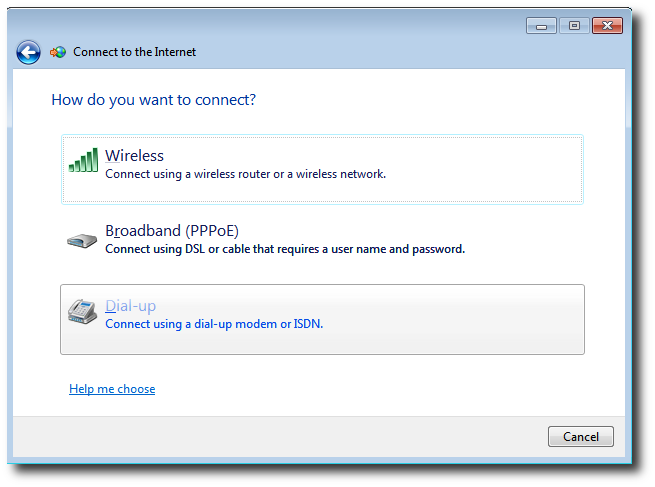 If you are already connected to a network via a wired or wireless connection you'll see a dialog indicating that an Internet connection already exists. Click on Set up a new connection anyway. The Connect to the Internet dialog will appear. 6. 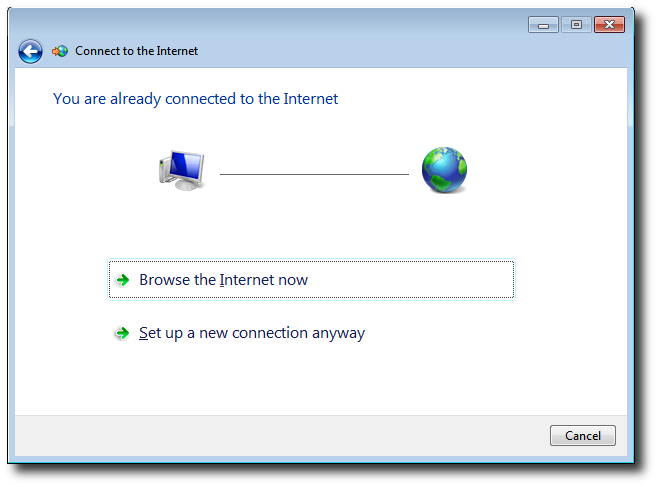 If you don't have an existing connection, the Connect to the Internet dialog will appear. 7. Click on the Wireless item. The dialog will disappear, and a menu of wireless networks will appear in the lower right corner of the screen. 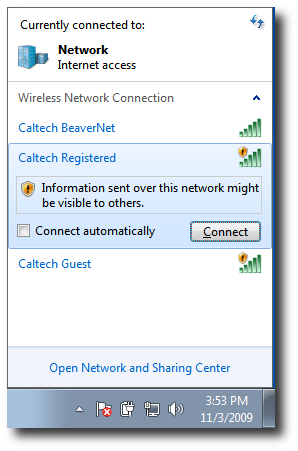 You should see the three Caltech wireless networks (Guest, Registered and BeaverNet). You may also see other networks as well. These are temporary conference networks for specific groups on campus. You should not try to connect to these networks unless you have received instructions to do so from the conference organizer. 8. 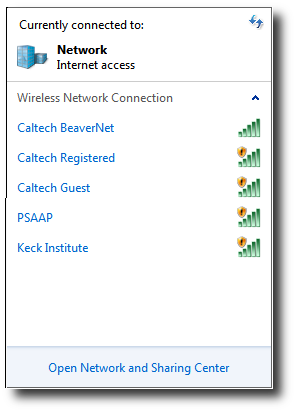 To connect to the Registered network, click on the Caltech Registered item in the wireless network menu. The item will expand. 9. Click on the Connect button to create a connection. 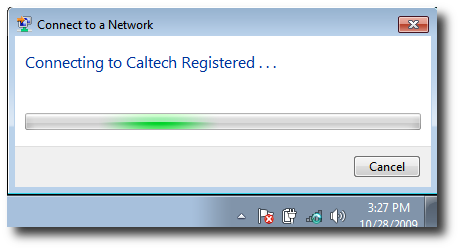 The menu will disappear and a Connecting to Caltech Registered progress dialog will momentarily appear. 10. If the connection to Caltech Registered has been successful, the Network and Sharing Center will be updated with the status of the network connection. You should now have a successful connection to the Registered network.